The State of Syria (French: État de Syrie, Arabic: دولة سوريا‎ Dawlat Sūriyā) was a French Mandate state declared on 1 December 1924, with effect from 1 January 1925, from the union of the State of Aleppo and the State of Damascus. It was the successor of the Syrian Federation (1922–1924) which had been created by providing a central assembly for the State of Aleppo, the State of Damascus and the Alawite State. The Alawite State did not join the State of Syria. In 1920, an independent Arab Kingdom of Syria was established under King Faisal of the Hashemite family, who later became the King of Iraq. However, his rule over Syria ended after only a few months, following the clash between his Syrian Arab forces and regular French forces at the Battle of Maysalun. French troops occupied Syria later that year after the League of Nations put Syria under French mandate. Following the San Remo conference and the defeat of King Faisal's short-lived monarchy in Syria at the Battle of Maysalun, the French general Henri Gouraud established civil administration in the territory. The mandate region was subdivided into six states. The drawing of those states was based in part on the sectarian make up on the ground in Syria. However, nearly all the Syrian sects were hostile to the French mandate and to the division it created. The primarily Sunni population of Aleppo and Damascus were strongly opposed to the division of Syria. In July 1922, France established a loose federation between three of the states: the State of Damascus, the State of Aleppo and the Alawite State under the name of the Syrian Federation. Jabal Druze and Greater Lebanon were not parts of this federation. The autonomous Sanjak of Alexandretta was added to the state of Aleppo in 1923. The Federation adopted a new federal flag (green-white-green with French canton), which later became the flag of the State of Syria. On January 1, 1925, the Alawite state seceded from the federation when the states of Aleppo and Damascus were united into the State of Syria. In 1925, Syrian resistance to French colonial rule broke out in full scale revolt, led by Sultan Pasha el Atrash. The revolt broke out in Jabal Druze but quickly spread to other Syrian states and became a general rebellion in Syria. France tried to retaliate by having the parliament of Aleppo declare secession from the union with Damascus, but the voting was foiled by Syrian patriots. Despite French attempts to maintain control by encouraging sectarian divisions and isolating urban and rural areas, the revolt spread from the countryside and united Syrian Druze, Sunnis, Shiites, Alawis, and Christians. Once the rebel forces had besieged Damascus, the French military responded with brutal counter-insurgency techniques that prefigured those that would be used later in Algeria and Indo-China. These techniques included house demolitions, collective punishments of towns, executions, population transfers, and the use of heavy armor in urban neighborhoods. The revolt was eventually subdued in 1926-27 via French aerial bombardment of civilian areas, including Damascus. On May 14, 1930, the State of Syria was declared the Republic of Syria and a new constitution was drafted. While the State enjoyed a certain degree of autonomy as a Mandate, France exercised significant authority over the government. The revolt that began in Jabal Druze led to France easing their hold on Syria and a constitution was drafted but not ratified by the French Chamber of Duties, and the coming of World War II stopped any progress in Syrian self-determination. Under French administration, the University of Damascus, known then as Syrian University was established in 1923, teaching in Arabic. It was the first university to be founded in Syria, being established through the merger of the School of Medicine and the Institute of Law, founded 1903 and 1913 respectively during the Ottoman era. ^ Michael Provence. The Great Syrian Revolt and the Rise of Arab Nationalism. University of Texas, Austin: University of Texas Press, 2005. ^ Peter Mansfield (1991). A History of the Middle East. p. 199. David Kenneth Fieldhouse (2006). Western Imperialism in the Middle East 1914-1958. Sami M. Moubayed (2006). Steel & silk: men and women who shaped Syria 1900-2000. Derek Hopwood (1988). Syria 1945-1986: politics and society. "No Yo-Yo!". Time. January 30, 1933. Retrieved August 19, 2009. 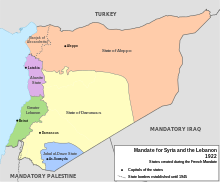 The Alawite State named after the locally-dominant Alawites, was a French mandate territory on the coast of present-day Syria after World War I. The French Mandate from the League of Nations lasted from 1920 to 1946. The Battle of Maysalun, also called the Battle of Maysalun Pass or the Battle of Khan Maysalun, was a four-hour battle fought between the forces of the Arab Kingdom of Syria and the French Army of the Levant on 24 July 1920 near Khan Maysalun in the Anti-Lebanon Mountains, about 25 kilometres (16 mi) west of Damascus. Yusuf al-'Azma was the Syrian minister of war in the governments of prime ministers Rida al-Rikabi and Hashim al-Atassi, and the Arab Army's chief of general staff under King Faisal. He served as minister of war from January 1920 until his death while commanding Syrian forces against a French invasion during the Battle of Maysalun. The Great Syrian Revolt or Great Druze Revolt (1925–1927) was a general uprising across Mandatory Syria and Lebanon aimed at getting rid of the French, who had been in control of the region since the end of World War I. The uprising was not centrally coordinated; rather, it was attempted by multiple factions – among them Sunni, Druze, Alawite, Christian, and Shia – with the common goal of ending French rule. The revolt was ultimately put down by French forces. The Franco-Syrian War took place during 1920 between the Hashemite rulers of the newly established Arab Kingdom of Syria and France. During a series of engagements, which climaxed in the Battle of Maysalun, French forces defeated the forces of the Hashemite monarch King Faisal, and his supporters, entering Damascus on July 24, 1920. A new pro-French government was declared in Syria on July 25, headed by 'Alaa al-Din al-Darubi. and eventually Syria was divided into several client states under the French Mandate of Syria and Lebanon. The British government, concerned for their position in the new mandate in Iraq, agreed to declare the fugitive Faisal as the new king of Iraq. Sultan al-Atrash,, commonly known as Sultan Pasha al-Atrash was a prominent Arab Druze leader, Syrian nationalist and Commander General of the Syrian Revolution (1925–27). He fought against the Ottomans, French, and even against the Syrian government in its days of dictatorship. One of the most influential figures in Syrian and Druze history, he played a major role in deciding the destiny of Jabal al-Druze and of Syria in general. Abd al-Rahman Shahbandar was a prominent Syrian nationalist during the French Mandate of Syria and a leading opponent of compromise with French authority. His devotion to Arab nationalism dated to the days of the Committee of Union and Progress and its "Turkification" policies. He supported the Arab Revolt during World War I and briefly headed the foreign ministry under Emir Faisal. The State of Aleppo was one of the five states that were established by the French High Commissioner in Syria and Lebanon General Henri Gouraud in the French Mandate of Syria which followed the San Remo conference and the collapse of King Faisal I's short-lived monarchy in Syria. Subhi Bey Barakat al-Khalidi or Suphi Bereket was a Syrian politician from Antakya, born into a family of Turkish origin. During the French Mandate of Syria, he was the president of the Syrian Federation and the State of Syria. The Battle of al-Mazra'a was one of the major battles of the Great Syrian Revolt, that led to the spread of the rebellion throughout the French Mandate of Syria. It was fought on 2–3 August 1925 between Druze and Bedouin rebels led by Sultan Pasha al-Atrash and a heavily armed French force of the Army of the Levant near the town of al-Mazraa, around 12 kilometres (7.5 mi) northwest of the city of al-Suwayda. The Alawite revolt was a rebellion, led by Shaykh Saleh al-Ali against the French authorities of the Occupied Enemy Territory Administration and later as part of the Franco-Syrian War against the newly established French Mandate of Syria, primarily in the coastal Jabal Ansariyah mountain range. The revolt was one of the first acts of armed resistance against the French forces in Syria, and its leader, Shaykh Saleh, declared his allegiance to the provisional Arab government in Damascus. He coordinated with the leaders of other anti-French revolts in the country, including the revolt of Ibrahim Hananu in the Aleppo countryside and Subhi Barakat's revolt in Antioch. The Hananu Revolt occurred in 1920–1921 in the western countryside of Aleppo and its purpose was to drive out French military forces from northern Syria. Support for the revolt was driven by opposition to the establishment of a French Mandate in the country. The revolt was named after its leading commander, Ibrahim Hananu, and mainly consisted of four allied revolts in the areas of Jabal Harim, Jabal Qusayr, Jabal Zawiya and Jabal Sahyun. The rebels were led by rural leaders and mostly engaged in guerrilla attacks against French forces or the sabotage of key infrastructure. Relations between France and Syria have a long, rich historical background. 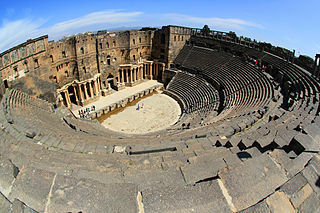 Syria was a French League of Nations Mandate for two decades following the collapse of the Ottoman Empire after World War I, before the last French troops were evacuated from Syria and Syrian independence was officially recognized and diplomatic relations between France and the newly created Syrian state were established.